In the past, I've outlined the benefits of Instagram, how to build a bangin profile, and how to attract the types of followers that will lead to more cash and closings for you. You’ve also heard me reference “cravable content” a few times in other posts when talking about real estate blogging and social media. Your posts should be an honest reflection of your team, your team culture, and your team goals. Team meetings, events, celebrations, etc, are all post-worthy. I don't’ want you just posting the photos though! Please always take the time to write a little something to help tell the story of your team and showcase what sets you apart from the competition. Furthermore, if your team culture is all about being aggressive, tech-savvy, and competitive, post pictures that demonstrate how you go after your goals and crush them for your clients. Edgy images and high-tech tips to buyers and sellers are ideal to help convey a cutting-edge brand. You know how agents are always complaining that buyers and sellers don’t understand how demanding it is to be a real estate agent? My answer to that is to show them then. The explosion of reality t.v. shows like Million Dollar Listing has taught us that people loooooove to see what goes on behind the scenes of real estate transactions. So give them what they came for! If Bravo can make bank off of going behind the scenes, you can too! Getting ready to list a property? Let your followers in on it! You don’t necessarily have to show them everything if you don’t want to, but tease them just enough to stir up some interest on the property. 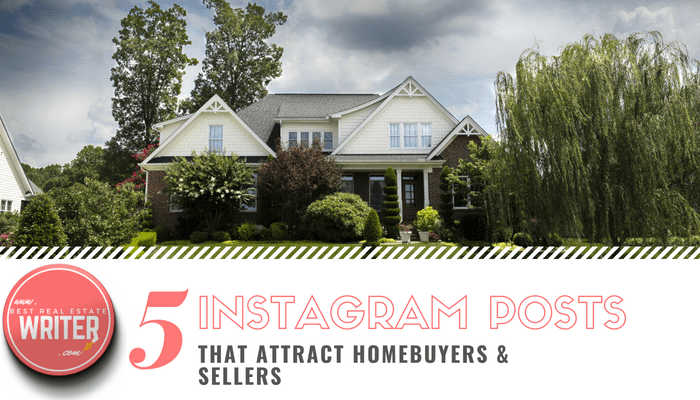 Your sellers will be thrilled that you’re already hard at work marketing the property, and you might even help attract a prelist offer. This is one of my all-time favorite ideas and something I require my clients to do! Since you are trying to bill yourself as a local expert, you need to show the people that you know everything there is to know about the area. That includes the schools, businesses, and people that make your farm such a special place to call home. I insist that you use your Instagram to feature all things local! Not only will this help fill your feed with valuable content, it will also give the people you feature an excuse to promote your business for you (for free!). Even better, they may even give you a deal or refer some to you as a thank you for the exposure. That’s what I call a win, win! You’re on a mission to transform yourself into the digital mayor of your market. Another simple way to make that happen is to take your followers on photo and video tours of various neighborhoods that you’re targeting. You may also want to do this in Instagram Stories. A key to getting the most out of these (and every other) posts, is to tag your location. This will help you show up even more in local searches. In fact, some recent research has proven that geotagging your posts can increase your engagement by up to 79%!